Did you have a countdown last night? Me.... Ooop! I don't wait for the year end to count but rather i count my blessing everynite before i sleep. Thanking God for being so kind to let me live another fresh day, and looking forward to count 'up and up' early the next morning with my little brother who is as naughty as ever. Yes! 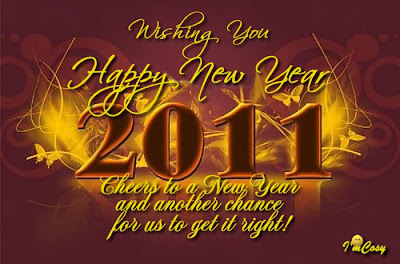 2010 had left us and i'm pretty sure 2011 would let us another chance to get things right! If i haven't fallen well enough with little darling, 2011 allows me to have another 'go' with her again. If i hadn't served well and efficient enough with all my clients, i promise to improve our relationship this year. If i had not spend enough time in the gym, i will make good in 2011. If i hadn't written intelligently on my blog, 2011 would turn me around with more readers to inspire me. If i hadn't given the best out of me to everyone i meet, i make sure 2011 would not happen again. Thank you 2011. I take this opportunity to wish all my friends, relatives and most important my blog readers A Happy New Year. Yes! Cheers to a New Year and another chance to get it right. Wish you and your Darling a WONDERFUL New Year 2011! May all be blessed with abundance of health, wealth and of coz... WISDOM! If you hadn't been naughty enough in 2010, try 2011...is another good wishing year for everyone.